Mickie McGraw had no intention of spending her career in a hospital, working with disabled people. She had already spent her high school years at home, after polio confined her to a wheelchair when she was 11. She got a taste of the “real world” while earning her bachelor’s degree in fine arts at the Cleveland Institute of Art, and she loved it. A year before she graduated from college, McGraw met a doctor who wanted to create an art program to help people recover during hospital stays. The doctor, George Streeter, had experienced the healing power of art when he got tuberculosis. He knew making art was therapeutic. He wanted her to join his practice, but the prospect didn’t appeal to her at first. By the time she graduated, though, the competitive world of graphic design wasn’t as attractive anymore. And she started thinking about the artists from the Society for Crippled Children (now the Achievement Center for Children) who had visited her while she was at home recovering from polio. They had inspired her to pursue art as a career. She now realized that she herself had been a beneficiary of the healing power of art. So she gave Streeter a call, and together, in 1967, they started the Art Therapy Studio in an old hospital ward at Highland View Rehabilitation Hospital (now MetroHealth Rehabilitation Institute of Ohio). In those days, there was plenty of time for patients to engage in art therapy, because their rehabilitation often took months. “I always had an advantage when I went to a person’s room,” McGraw recalled. She would arrive with a cart filled with paintbrushes and paper—not needles and bandages. The program grew and, by 1977, McGraw was offering community-based programs for patients after they were released from the hospital. From the outset, the Art Therapy Studio has been a not-for-profit organization, today serving about 1,700 patients a year. But what makes McGraw special isn’t just her ability to use art to help break down emotional barriers. She understands the heart and souls of artists and encourages art therapists to continue to express themselves by creating art. “If you don’t experience it for yourself, you can’t share it,” she affirmed. 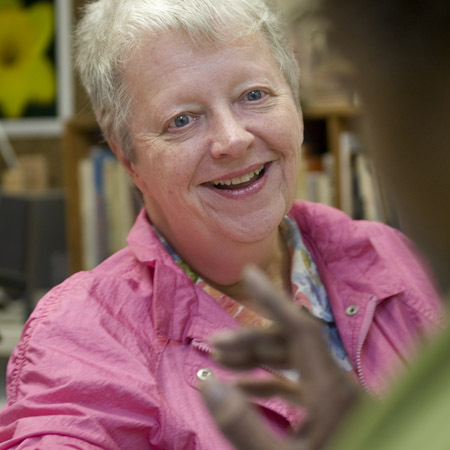 Although she retired from MetroHealth in 2000, McGraw still serves on the Art Therapy Studio board and teaches and consults in the field.